Celebrated for a velvety beauty of tone and elegant musicality as well as for his excellent acting, Leonardo Caimi has established himself as one of the most acclaimed tenors of his generation, singing at prestigious venues and festivals such as the Royal Opera House Covent Garden, the Teatro alla Scala, the Teatro Real in Madrid, the Bavarian State Opera in Munich, the Teatro Colón in Buenos Aires, the Deutsche Oper Berlin, and the Salzburg Festival, amongst others. 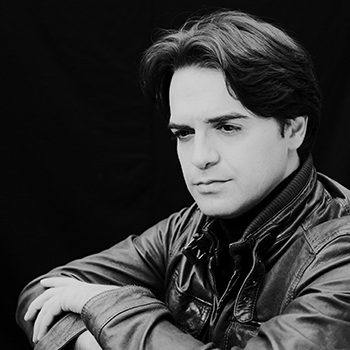 Engagements in the 2018/2019 season include his debut at the Royal Opera House Covent Garden as Don José in Carmen, Calaf in Turandot and Don José in a new production of Carmen at the Leipzig Opera, Roberto in Puccini’s Le villi at the Teatro del Maggio Musicale in Florence, Gustavo III in a new production of Un ballo in maschera at the Staatstheater Darmstadt, Henri in a new production of Verdi’s Les vêpres siciliennes at Theater Bonn, Cavaradossi in Tosca at the Aalto-Theater Essen, and Pinkerton in Madama Butterfly at the Teatro Villamarta in Jerez. Exciting future engagements during the 2019/2020 season and beyond include his role debut as Des Grieux in Massenet's Manon at the Israeli Opera in Tel-Aviv; Calaf at the Oper Köln and at the Opernfestspiele St. Margarethen; Cavaradossi in Tosca and Hoffmann in a new production of Les Contes d’Hoffmann at the Royal Opera House Covent Garden. Among notable performances from the 2017/2018 season were his debut at the Bavarian State Opera in Munich singing Henri in a new production of Les vêpres siciliennes, Carmen (Don José) at the Teatro Real de Madrid, Simon Boccanegra (Adorno) at the Teatro San Carlo in Napoli, Cavalleria Rusticana (Turiddu) at La Monnaie in Brussels, Turandot (Calaf) at the Opera Wielki in Warsaw, Un ballo in Maschera (Riccardo) at the Municipal Theater of Rio de Janeiro, and Tosca (Cavaradossi) at the Teatro Municipal de Santiago de Chile. Further career highlights include Carmen (Don José) at the Deutsche Oper in Berlin and a very successful debut of the role Calaf in Turandot at the Leipzig Opernhaus, as well as La bohème (Rodolfo) at the Maggio Musicale Fiorentino in Florence, Madama Butterfly (Pinkerton) in Seoul and at La Monnaie, Adriana Lecouvreur (Maurizio di Sassonia) at the Teatro Colon de Buenos Aires, a concert performance of Le villi (Roberto) for the RTVE at the Teatro Monumental in Madrid, Tosca (Cavaradossi) at the Frankfurt Opera and La Rondine (Ruggero)at the Puccini Festival in Torre del Lago. Caimi has worked with many of the world’s most esteemed conductors and directors. These include R. Muti, L. Maazel, G. Gelmetti, D. Oren, C. Rizzi, E. Pidò, S. Ranzani, Miguel Ángel Gómez-Martínez, Jean-Claude Cadadesus, Alain Lombard, M. Stefanelli, E. Queler, R. Brignoli; and directors F. Zeffirelli, R. Lepage, S. Vizioli, W. Pagliaro and M. Scaparro, L. Mariani, M. Martone, D. Michieletto, W. Decker, and Ettore Scola. He has a diploma in voice from the Conservatorio «A. Corelli» di Messina and diploma in clarinet from the Conservatorio «F. Torrefranca» di Vibo Valentia, where he also studied composition. Leonardo Caimi also obtained a degree with highest honors in Philosophy at the Università degli Studi di Messina. "Les Vepres Siciliennes - Henri"
...È anche il debutto del ruolo principale maschile. Coloro che hanno ascoltato Leonardo Caimi per la prima volta a Francoforte come "Cavaradossi" conoscono le qualità di un vero e solido tenore italiano. Anche se a Francoforte si esegue la versione originale francese, l’"Henri" di Caimi suona come un tipico cavallo di battaglia dell'opera italiana. Egli supera con padronanza le temute vette del ruolo.